Many museums, archives and libraries are exploring Linked Open Data to make their online collections more meaningful to researchers and to the public at large. From the Rijksmuseum in the Netherlands to the Cooper-Hewitt in New York, our cultural heritage can be explored in digital form with links to help us dive deeper. These aren’t just spiffed up websites, these are living representations of the physical collections with hooks for developers to build new applications that link back and let us look, listen and learn in new ways. What if we could use this emerging foundation to allow researchers to publish links from one institution to another, connecting a letter in one archive to an artifact in another museum? People have been talking about these ideas since Vannevar Bush imagined the Memex the 1940s. Making it actually work requires a lot of disparate pieces: standard protocols, ontologies, digital representations of the physical works, and an audience with the digital tools for easy access. I’ve been investigating a very small part of this challenge: connecting people through their things. Through interviewing researchers, archivists and museum collections managers, I’ve learned about traditional research techniques that suggest how an online system could work. Instead of linking as a post-process, the act of linking data could be part of the experience of researching and exploring online collections. A Social Network of Dead People? What if we could pull all of this information together across collections in different organizations and present it in a unified way? Last year, working as a Presidential Innovation Fellow at the Smithsonian, I imagined what this might look like (illustrated above): a social network of historical figures linking archival documents to give us insights about history. I quickly discovered the SNAC project (Social Networks and Archival Context) which started investigating this idea several years before me. SNAC takes structured data from EAC-CPF files, and connects people through annotations made by archivists all over the world who contribute their data to the project. While there may be many people named Russell Hatch, these boots only belonged to one of them. Mrs. Sydney Blake travels to South America on a scientific expedition, but her colleague’s field notebook talks only about Doris. Archival research reveals that Doris Holmes Blake, wife of Sydney, was the travel companion. Even with clear records, facts can be disputed. There are errors in the archives that do not besmirch the disciplined care of the archivists. A birth certificate may show one date and a newspaper article a different one. One historian may assume the birth certificate is correct, until another finds a diary entry telling the funny story of a town hall clerk who got the date wrong. One researcher told me of his challenges recording biographical data from Canadian Civil War soldiers because some thought it funny to write Feb. 29th as their birthday. We know an individual was actually born at a specific date and time, but once that time is in the past, facts can become subjective. People have always researched history by looking at the artifacts left behind. Even today, researchers travel from archive to library, often across the world, to piece together stories from letters, diaries and even notes in guestbooks at historic homes. They build a picture of what a life was like from prized possessions or everyday objects now housed in museums, from news sources, and from the stories written by friends and colleagues, both positive and slanderous. Thousands of researchers create these kinds of links every day. They are footnotes in scholarly articles, books, and research papers. They are the tabs open in a grad students’ browser. Interviews with researcher suggest that if we could allow them to leave a trail, they would contribute to the world-wide store of knowledge. We’re starting to see new patterns emerge online with new interfaces that allow people to take part in linking historical artifacts. 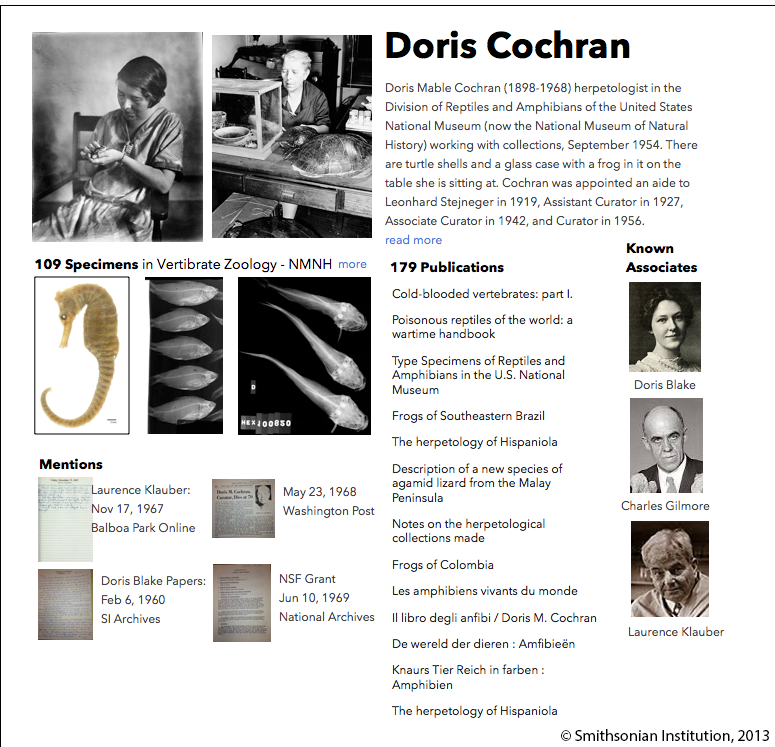 Volunteers transcribing field notebooks link scientists, subjects and specimens using wiki-like markup at FromThePage. 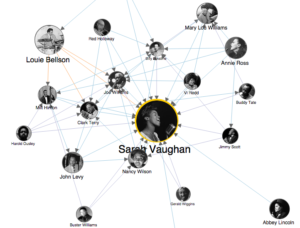 Jazz enthusiasts can read transcripts of conversations with musicians at LinkedJazz 52ndStreet to build a social network that with links back to the oral histories. Emerging on the web, there’s a new model of publishing. Instead of links being created with markup and behind-the-scenes tools gated by a webmaster, connections can be added with simple text annotations or the touch of a button. 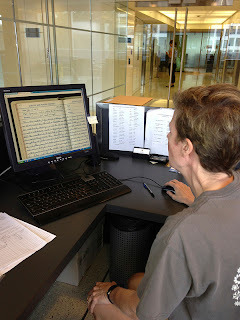 At BalboaParkOnline volunteers transcribe documents and add links. Sarah Vaughan’s social graph at LinkedJazz created by volunteers annotating transcripts of oral histories.